A message from Mr. Hussein Boroujerdi, prisoner of conscience, who writes from his cell in Evin prison, to emphasize that the anniversary march, is not proof of the regime adequacy. Once again, the month of Bahman is upon us and the shame and scandal that tainted the pages of human history; for over thirty-five years, the obscenity and illicitness of an irrational revolution, blackened the entire area and gutted Iran from border to border. The Decade of Fajr is the record of a inculpable nation who are punished for their devotion to God, for being true to their morality and faith’s canons; but they were so badly burned by the red hot brand of religion, that for generations to come, there will be no sign of Islam. The Shah’s rule saturated society with faith and ignited the passion for the ‘Shia family’ (Ahl al-Bayt) among people, that they gambled everything they had on the Shia authority. Keeping one’s faith became the price of the whims and perversities of the power-grabbing clergy who were and are the main reason for the downfall of religious values. And now the religion of the rulers has emptied the hearts of the people from any will to be bamboozling clerics and has filled them with hatred, revenge, contempt for anything and everything that smacks of Islam. As a result of the monarchic Mullahs ceaseless lies and the teflon accusations of the regime-run media, we have a country whose problems and troubles are unprecedented and non-existent anywhere in the world. Today, the gangs of authoritarian regime insiders celebrate their anniversary; they gather around a sumptuous table with full and brimming pockets and then kick up their heels and dancing on the corpses of innocent peasants and a crushed nation. 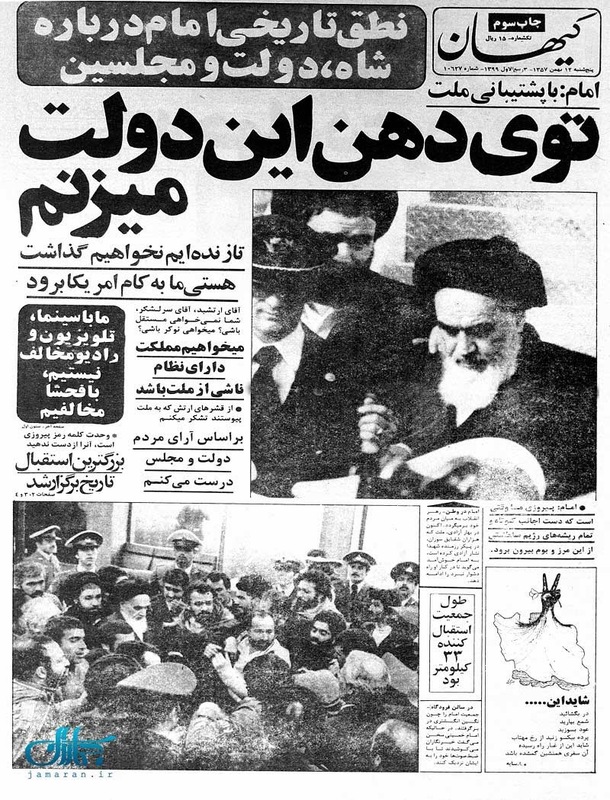 Expenses for the coronation ceremonies held for the supreme leader and plans for the celebrations of the revolution, along with the marching herds, is a dagger which tears at ill-fated Iranian year after year. Now I ask the world, does march somehow prove this regime adequacy? Do all those who are out on the streets of Tehran and other cities, comprise the collective voices of seventy seven million population of Iran? The Evil murdering rulers claim that every citizen of our country is a follower and fan of their revolution! And we say that the overwhelming majority of the children of this land, systematically oppose political Islam. As proof, the December 30th, 2013 (9th of the month of Dey, 1392) rally which cost large sums of money was a show of force by the regime’s own supporters; however when the regime forces turned up in Palestine Square in Tehran and saw the embarrassingly thin turn out and real lack of support, the Basiji commander Mohammad-Reza Naghdi walked out for fear of being discredited. The fact is that if the God-hating and blasphemous regime elite do not act violently, those who oppose them and their revolution, and their so-called Republic, would pour out into the streets, so that the people of the world could get a good look at the hidden realities inside this ravaged country.